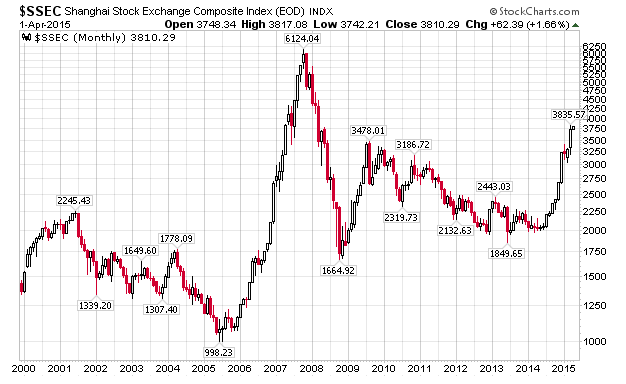 The Shanghai stock market is on a tear as the following charts show. 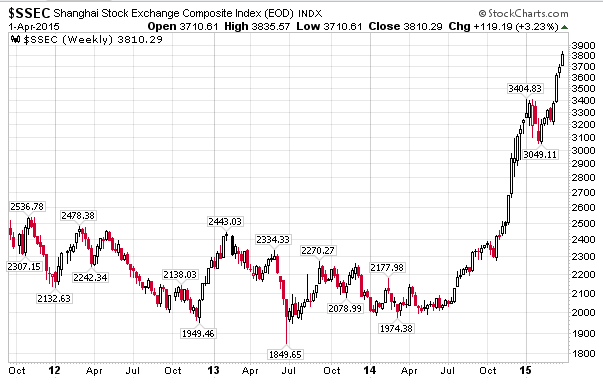 Since July 2014, the index has gone from roughly 2066 to 3810. That is a rise of 84% in eight months. As with every major bull market participants just cannot wait to get in, and cannot get in enough when they do. Bloomberg reports Shanghai Traders Make Trillion-Yuan Stock Bet With Borrowed Cash. Shanghai traders now have more than 1 trillion yuan ($161 billion) of borrowed cash riding on the world’s highest-flying stock market. The outstanding balance of margin debt on the Shanghai Stock Exchange surpassed the trillion-yuan mark for the first time on Wednesday, a nearly fourfold jump from just 12 months ago. 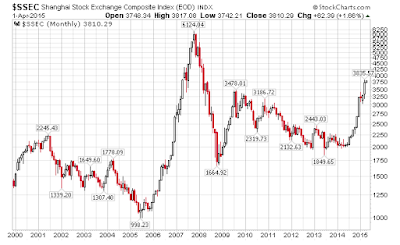 The city’s benchmark index has surged 86 percent during that time, more than any of the world’s major stock gauges. 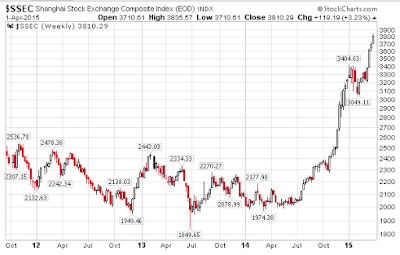 While the extra buying power that comes from leverage has fueled the Shanghai Composite Index’s rally, it’s also sending equity volatility to five-year highs and may accelerate losses if a market reversal forces traders to sell. Margin debt has increased even after regulators suspended three of the nation’s biggest brokers from adding new accounts in January and said securities firms shouldn’t lend to investors with less than 500,000 yuan. Chinese investors have been piling into the stock market after the central bank cut interest rates twice since November and authorities from the China Securities Regulatory Commission to central bank Governor Zhou Xiaochuan endorsed the flow of funds into equities. Traders have opened 2.8 million new stock accounts in just the past two weeks, almost on par with Chicago’s entire population. For BNP Paribas SA economist Richard Iley, the surge in Chinese margin purchases is among signs of a bubble fueled by individual investors. More than two-thirds of new investors have never attended or graduated from high school, according to a survey by China’s Southwestern University of Finance and Economics. Statements from analysts that "no one could see this coming"
The one thing we do not know is how big these bubbles get before they burst.